The Jewish Federation of Northwest Indiana is launching JWRP’s Momentum Year-Long Journey this summer! The JWRP’s Momentum trip – run in partnership with the Jewish Federation of Northwest Indiana – brings mothers to Israel with children at home under the age of 18. Informational meeting for interested participants. ​To RSVP or for more information, contact Susan Tepperman at susan@federationonline.org or (219) 301-0960. The Jewish Women’s Renaissance Project (JWRP) was established in 2008 by eight Jewish women who came from all walks of life, affiliation, observance, and age. They searched for a way to empower women to change the world through Jewish values. Together, they started the Jewish Women’s Renaissance Project, a global movement designed to empower women through Jewish values. In 2009, the JWRP brought its first group of Jewish women on a life-changing experience to Israel, which came to be known as the Momentum year-long journey. 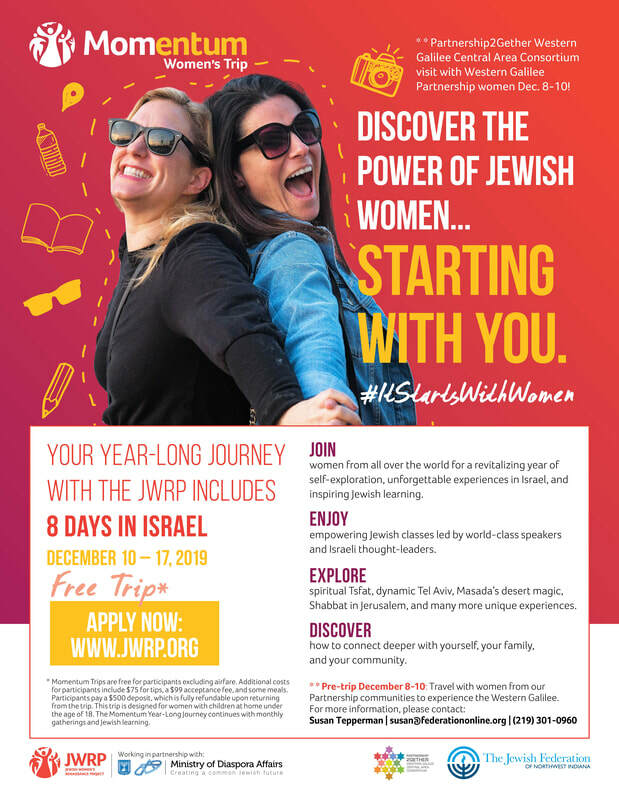 The JWRP’s flagship program is the Momentum Year-Long Journey, which includes eight life-changing days in Israel for women across the globe, specifically Jewish mothers with children at home under the age of 18. Since 2009, over 15,000 individuals from 26 different countries have experienced this life-changing journey, returning home with a connection to Jewish values, ties to Israel and the tools to take action in their homes and communities.